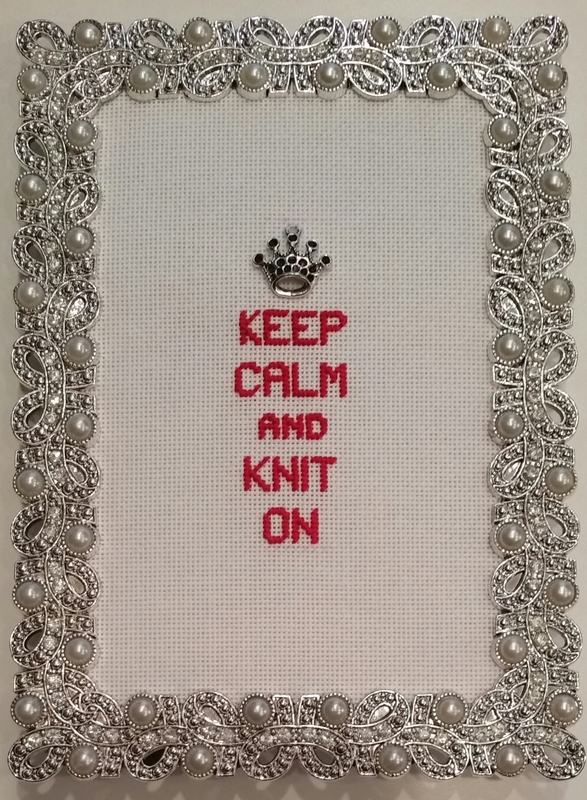 The kit was given to me as a thank you gift from Michele Roberts (her design was to read “stitch on”) & I continued the thank you by stitching it for Roya (coworker) who gave me the Queen’s canvas. Roya has family in the UK & she knits (easily switched). So, this seemed perfect. And, she liked it! The frame is from Michael’s. The second clue in the Stitching Games 2015 run by stitcherie is “football” & why not – it was released on Superbowl Sunday! 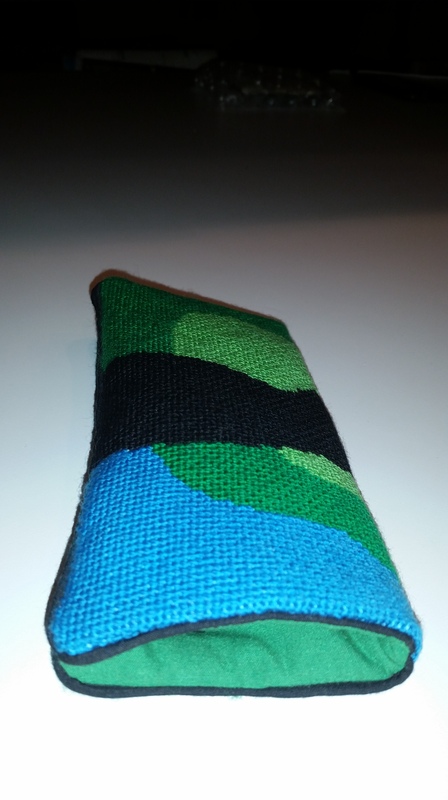 I went through SuZy’s Portable Stitches & have 2 leading candidates heading to the Superbowl (a test canvas) – Fran’s Stitch (looks like a lot of footballs) & French Swag (looks like a gridiron). May the best stitch pattern win. 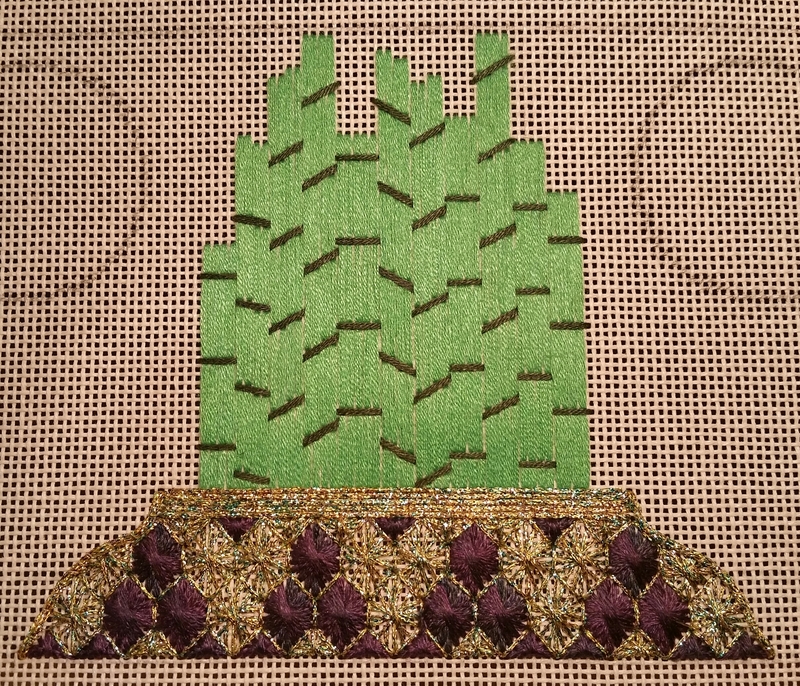 Fran’s Stitch was out of the running when I layer it out on graph paper because it was too large for the area. I also went through Needlepoint Dictionary of Stitches on my Kindle & found Hex shape which looks like a little football. 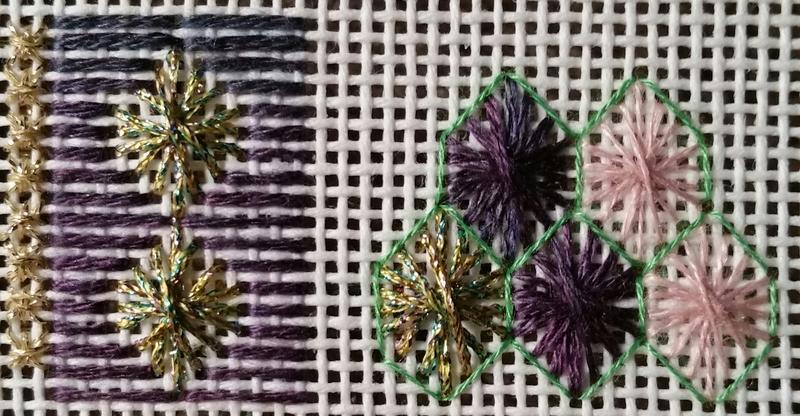 So, I tried combining the Rhodes stitches from French Swag & the Hex shape (a slightly smaller one) with Stripes A (from Portable Stitches) but it was too many stripes & no contrast to the bamboo. The part I like is the Hex. So, I decided to keep it simple and I made the top of what I see as a decorative vase all Hex shapes. 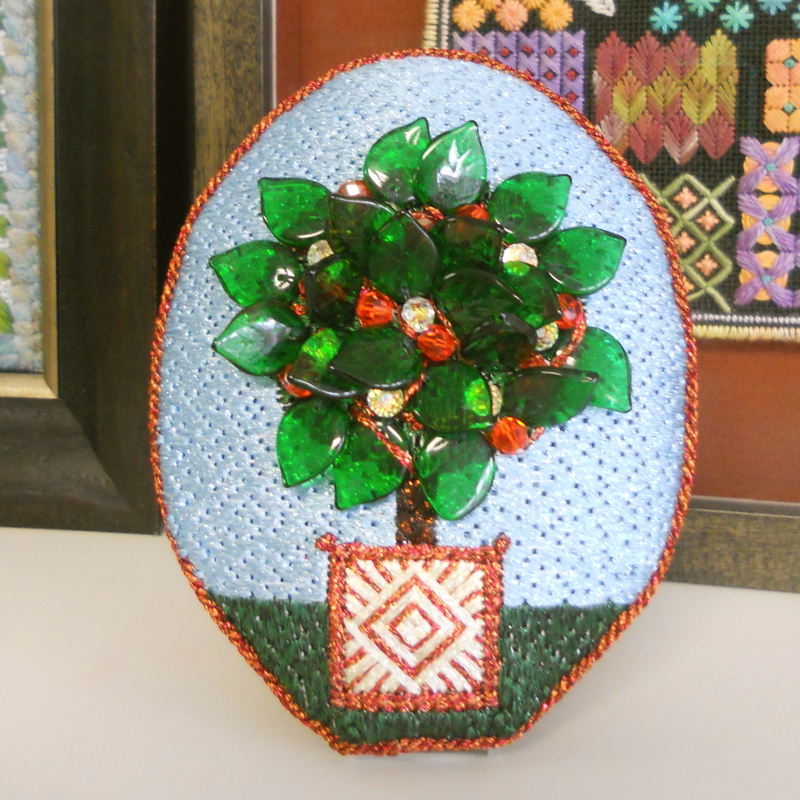 I used Kreinik (045) #4 for the footballs, #16 for the rim of the vase, & #32 for the sides. The thread has a bit of green that complements the bamboo. The purple comes from selected portions of Gloriana Seaweed #088. 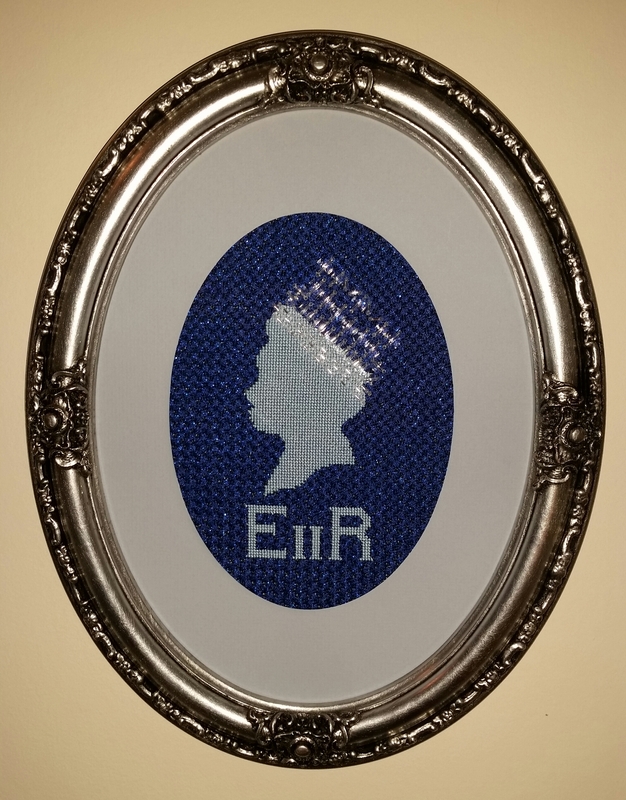 The Queen’s Silhouette is traveling to Woodlawn for the 52nd Annual Needlework Show. She’ll be there for the month of March. Before the Queen left, she was able to visit the people who I work with including Roya who gave me the piece. She brought it back from Tapisserie in London. Unfortunately, Queen Elizabeth wasn’t able to visit my ANG stitching friends. Nancy & Murphy at the Artful Framer in Paoli did a fantastic job with the frame. They were very patient helping us (my husband & ) picking it & the mat out. I really appreciate their efforts. 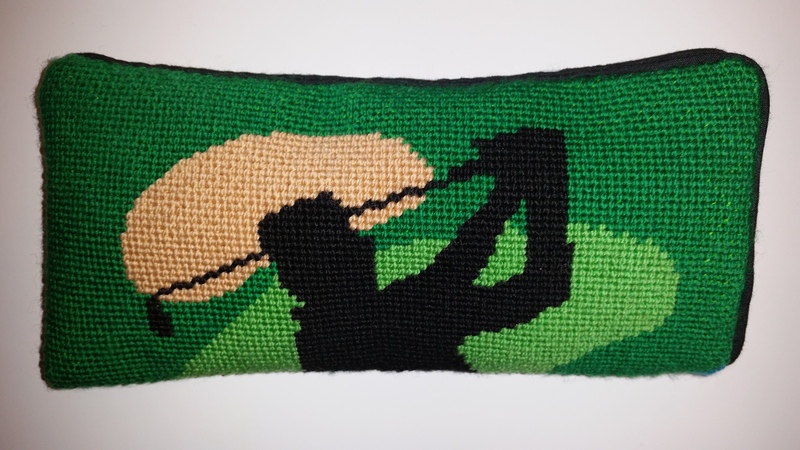 I really recommend deciding on how you will finish a piece before you finish stitching! I switched to an oval but not the same size oval as typical mats come in. But, they figured out a way!